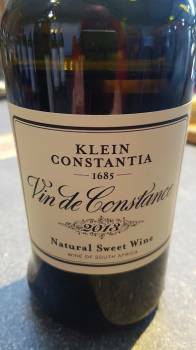 Winemaker Matt Day of Klein Constantia has worked hard over the last few vintages to bring ever more refinement to the property’s famous sweet wine that is Vin de Constance (R895 per 500ml bottle) and the currently available 2013 is his best effort yet. From Muscat de Frontignan, the nose is wonderfully fragrant with notes of wild flowers, herbs and Turkish Delight while the palate is pure and fresh – intensely flavoured but not thick or weighty, the finish long and pithy. Extraordinarily vivid yet equally elegant and subtle.